The human body has a bio-energy-circulation system similar to the blood-circulation system. The bio-energy flows along 12 main meridians, or channels. These are symmetrical on each side of the body, each pair being related to a specific organ. 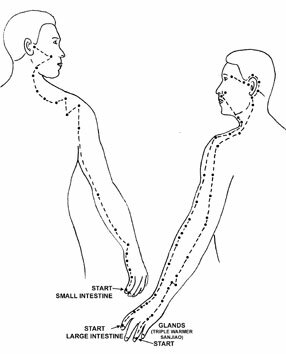 Try to find tender points by pressing with a thumb or finger in a circular motion around the area indicated for each point on the charts of the meridians. For treatment concentrate on the most painful spots, pressing them frequently as explained for reflexology in Chapter 2. Generally, the pain decreases after some time of pressing, but should it increase instead, then interrupt the treatment for several days. 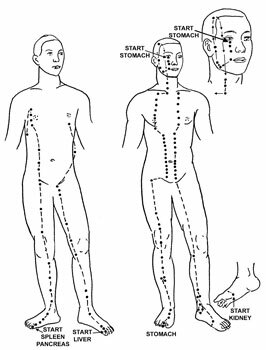 Tender pressure points may stem from either a local condition or a problem in the main organ associated with that particular meridian; also, the pain may be referred from a more distant body part connected to the same meridian. There is, of course, an interaction between these different areas. When the main organ is inflamed, most points along its meridian will be tender. The points especially useful for diagnosing and treating the organ directly are located around the ankles and wrists. They are called 'source-points'. 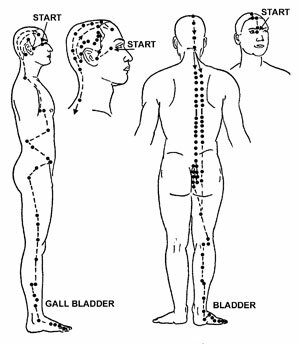 Further source-points are situated along the bladder meridian close to the spine, and also as local-points on various meridians near the target organ. The following general rules are useful for selecting points for treatment. Points above the knees or elbows reflect mainly local conditions, while those below these joints reflect local as well as distant conditions at other parts of the meridian. Generally, the closer the points are to the fingertips or toes, the closer to the other end of the meridian will be the related sphere of influence. For acute, painful conditions treat mainly distant-points, for chronic conditions add local-points. This means, for example, that if you wish to treat an acute eye or ear pain you select points near the toes and fingers, while to treat shoulders and hips you move close to the elbows or knees. For a more chronic condition you press in addition the tender spots around the ears and eyes, and hips and shoulders. You may also add points of other meridians that have a direct relationship to the problem. Eye problems, for example, are often associated with poor kidney and liver functions. Therefore, some points of these organs may be treated as well. Furthermore, the points at the shoulders, the shoulder blades and the base of the neck control the circulation to the arms and hands; while the points at the hips, the buttocks and around the base of the spine control the circulation to the legs and feet. Therefore, treat poor circulation, numbness and pain in the extremities by pressing the points in the indicated control areas. Instead of needling or pressing acupuncture-points, you may place the north pole of a small magnet on a point for stimulation or the south pole for sedation. A main problem in healing is the balancing of the energy flows. Usually, this balancing occurs unrecognised as a by-product of other successful treatments. However, healing can be initiated and accelerated by deliberately treating the meridians with the express purpose of balancing. A useful method for this is to follow the outline of a meridian (see the Meridian Chart below), with one finger or with several fingers held closely together. Following a meridian in the normal flow direction is strengthening, while tracing in the opposite direction will weaken and sedate the meridian. The results of these tracings may be checked with muscle testing. In order to perform a meridian tracement, pause with your fingers for a moment at the starting-point; then follow the meridian in a quiet, fluent motion. The fingers should be close to the body. They may touch the skin or clothing but do not actually need to touch. It is enough to remain within about 5 cm of the actual course of the meridian. Start by energising your hands. If you are experienced in working with energies you may just do that with your imagination, otherwise shake your hands for about ten seconds and during the actual tracing try to feel or imagine feeling energy streaming out of the tips of your fingers. Related meridians on both sides may be traced simultaneously. In repeated tracings move the hands back to the starting-point in a wide sweep to avoid following the meridian in the reverse direction. At the end of each tracement lightly flick the fingers to remove any accumulated negative energy. You may trace all the main meridians once or several times daily, or you may concentrate on the meridians most in need of improvement. Important meridians may be traced repeatedly during the day for 20 times or more. The strengthening effect may be increased if after several tracings you do a muscle-tensing exercise, Taking a deep breath while tensing your whole body and then relaxing it during exhalation. The meridian system allows us to understand why many disease symptoms appear in certain body parts when the originating cause is a weak or inflamed organ in another location. The diagrams show only the surface courses of the meridians; inside the body each one is connected to its associated organ. In this way the deranged energy pattern of an organ is easily transmitted to other body parts along the course of the meridian. Diseases of the ear, migraine and hip problems can now be seen energy-wise to be associated with the gall bladder. Arthritis of the hip, therefore, is often a gall bladder problem, while arthritis of the shoulders may have its cause in the intestines. Gout, affecting the big toes, stems from the liver, while swollen ankles are related to the kidneys. See the enclosed Table of Meridian-Disease Relationships. Furthermore, each organ-meridian system has a two-hour period of maximum activity, and a period of minimum activity 12 hours later. An inflamed organ is often more painful during its active period, while a weak system should not be stressed during low periods. In acupuncture books you may find different names for two of the meridians. The circulation meridian is also called the pericardium meridian, while the gland meridian may be called the triple-warmer meridian. While pulse diagnosis is the expert Chinese way of determining the energy balance of the meridians, you may often be able to judge by the kind of diseases or symptoms present. Generally, overacidity, pain and inflammation along the course of a meridian or in its target organ call for sedation, while coldness and weakness call for stimulation. According to Chinese teachings, some interesting characteristics are associated with the meridians of the kidneys and liver. Weak kidney meridians are indicated by a lack of will and sexual impulse, and furthermore by negativity, unease, timidity and impatience. In the case of an overactive kidney meridian, on the other hand, the energy level is abnormally high and you cannot stop working. The liver is similar. A weak meridian shows itself in dizziness, a clumsy walk, easily tiring eyes and a short temper. An overactive liver meridian causes excessive excitability, crying moods and a compulsion to continue working. According to Chinese traditions, the main organs and their meridians are also associated with different emotions. An excessive amount of these emotions can damage the associated organs, while a disease of these organs may, in time, lead to excessive displays of these emotions. Accordingly, anger is associated with the liver; excessive laughter and gayness, but also fright, with the heart; worry and emotional tension with the spleen and pancreas; grief, sorrow and negativity with the lungs; and fear and timidity with weak kidneys. Magnets may also be used for tracing meridians. Move the appropriate pole of a magnet close to the skin along a meridian. This has a much stronger balancing effect than using the fingers. For strengthening use the north-pointing pole and for sedating the south-pointing pole towards the skin. With muscle testing you can often detect a strong preference of a meridian for one of the magnetic poles. This can be used to diagnose the condition of the associated organ (if weak or inflamed). If muscle testing is not possible or successful, use the south-pointing pole on the body side that shows more inflammation or more tender acupressure-points; trace the opposite meridian with the north-pointing pole. Some individuals feel immediately which pole and direction of tracing is beneficial, while the opposite pole and direction may feel unpleasant. The most powerful sedating and pain-relieving effect is the south-pointing pole traced against the meridian flow. You may either use a small cylindrical magnet, or one or more combined button magnets, or a small elongated ceramic magnet. Generally use a small or weak magnet, as a strong magnet may cause neighboring meridians to be traced in the wrong direction. I prefer a small (5 mm) button magnet glued/tacked to the end of a pen or pencil with the appropriate color, red for the stimulating and blue for the sedating pole. You may trace related meridians on both sides of the body simultaneously. If muscle-testing shows that tracing the opposite flow direction of a meridian with the south-pointing pole towards the skin is strengthening, an infection or inflammation is likely somewhere along the course of the meridian or at its associated organ. Weak meridians or their related organs, on the other hand, test stronger when tracing with the north-pointing pole in the correct flow direction. If tracing feels stronger with the south-pointing pole in the correct flow direction, but weak when traced in the opposite direction, only a moderate amount of overactivity is in the meridian or its related organ. Instead of using magnets, meridian tracings may be done with energies concentrated from a pyramid, orgone accumulator or any other energy generator. Use a metal tube, preferably galvanised iron or stainless steel wrapped in dry cloth, for the actual tracing; this may be connected to the pyramid by an insulated wire. For sedation, try a metal tube (best galvanised iron or steel) from which an insulated wire leads into a container with water. Often, effective meridian therapy can be achieved simply by tracing a meridian mentally - moving the awareness along the meridian. In addition, you may try to feel a warm or orange energy stream moving in the normal flow direction for stimulation, while for sedation you may try to feel a cool or blue stream moving either in the normal direction or against it. If in doubt, move in the normal direction and imagine the meridian to be traced with the correct pole of a magnet. You do not actually need to know which pole it is. Begin tracing at points marked 'start'. 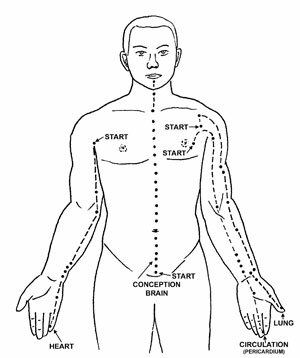 Dots indicate acupuncture or pressure points. Apply finger pressure when tender. The Governing Meridian (not shown) starts at the tailbone and follows the spine in a straight line over the top of the head down the nose and ends between nose and upper lip.